This week there were reports of the amazing advances being made in brain-computer interface (BCI) technology. Following just weeks of training, a 52-year old woman, paralysed from the neck down, was able to use her mind to control a robotic hand to pick up objects on a table, including cones, blocks and small balls, and put them down at another location. She was even able to use the hand to feed herself chocolate. 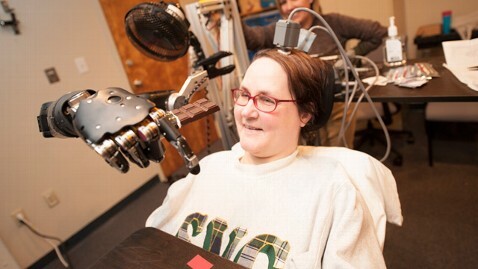 Having had two arrays of microelectrodes surgically implanted into her left motor cortex, Jan is wired up to a computer that has been programmed to interpret the signals her neurons emit. This computer then passes on the interpreted signals to the robotic arm, which moves in accordance with the signals in real time. Aside from the awesomeness of the technology, the use of neuroprostheses such as this raises a whole host of interesting philosophical and ethical questions. Particularly as the technology gets more sophisticated and more integrated, the distinction between the machinery being used and the person using it will become increasingly blurred. In the video, Jan already describes how she went from having to ‘think’ the commands (‘clockwise, up, down, forward, back…’) to merely having to ‘look at the target’ to effect accurate movement of the arm. This phenomenon is sometimes labeled ‘transparency of use’, where a tool serves a person’s goals without itself being an object of effortful control. But what if the technology develops to the point that it no longer resembles our usual understanding of ‘tool use’? Might there be a point at which neuroprostheses become part of the people who control them? Jan, the lady in the video, refers to the robotic arm as Hector (I think they all know the arm as Hector), suggesting that she probably does not think of it as part of herself. However, it is possible that by operating ‘transparently’ through Hector over a longer period of time Jan would start to experience the arm as part of her. Philosophical concepts such as ‘embodied agency’ and ‘extended mind’ (which suggest that the boundaries and components of agents are negotiable and re-negotiable, and that objects in the external environment are utilised by the mind in such a way that the objects can be seen as extensions of the mind itself). Neurological research on body schema (how neurons respond to information in the world to yield action-relevant coding of visual space: such coding essentially defines a body in terms of its capabilities for action). We might further test our intuitions about whether a particular prosthesis is ‘part’ of the person controlling it by asking a pseudo-legal question. Let’s imagine a paralysed person (much like Jan) who, for many years, has made daily use of a portable, wireless neuroprosthesis. Her use of this prosthesis is as effortless and as accurate as a healthy person’s biological hand use. I approach her in the street and, with minimal force and without disturbing her biological body whatsoever, disconnect the hand and run off with it into the night. Have I committed theft or assault? Have I intruded on her property or on her? Might we even say that there has been something like bodily harm? I do not intend to embark on an analysis of legal definitions of assault here and am not posing this as a strictly legal question. Of most importance is that assault, in all its various forms, is an offence against the person. What the scenario is intended to do is prompt reflection on what matters when we think about whether a piece of technology such as a neuroprosthesis can ever be thought of as part of the person controlling it, rather than just something she uses. Does it matter how ‘removable’ the prosthesis is and/or how often it is removed? For example, do our intuitions change if a prosthesis is never removed compared to a prosthesis that is regularly detached and left on the kitchen table? What is it about flesh and blood that is so integral to what it means to compromise bodily integrity? Is it that that flesh wounds might not heal whereas prostheses are fixable and replaceable? Would it make a difference if prostheses were incredibly difficult to fix or replace? Flesh often repairs itself. Is there something important to do with pain and damage to health (or at least the threat of these) that we see as integral to intrusion on bodily integrity? Does it matter whether the person experiences her prosthesis as part of her and, correspondingly, how she experiences my seizing it? The final point prompts an interesting comparison: imagine a man who hates his arm and does not identify with it. In fact, he’d really rather it would be cut off. (There was a recent case in the news where a man with bodily integrity identity disorder really did feel like this about his leg. He, rather poetically, said that it feels like his ‘soul doesn’t extend into it’.) Suppose I come and attack his hated arm, rendering it temporarily useless. To my surprise, far from calling the police, the man is very happy that his arm has been attacked and actually wishes I’d damaged it more. Now let’s compare this with a modified version of the prosthetic arm removal. Let’s imagine that instead of detaching the lady’s prosthesis I calmly but decisively twist it until it ceases to function (the criminal possibilities would now be criminal damage to property or assault). The lady consequently feels distressed and violated. Perhaps, for her, it is as if her soul extends into her prosthetic arm. The interesting question is: to whom did I do the most harm? The man who despises his arm or the lady with the prosthesis? Crucially, upon which person did I most intrude? Whilst Jan may easily distinguish herself from Hector, future BCI technology will become increasingly integrated – physically and psychologically – into the people who use it. Amongst the philosophical and ethical questions this raises, the most challenging may be whether we will have to fundamentally revise how we delineate persons and distinguish them from the world with which they interact. See Clark, A. (2007), ‘Re-Inventing Ourselves: The Plasticity of Embodiment, Sensing, and Mind’, Journal of Medicine and Philosophy, 32: 263–282. See Maravita, A., and Iriki, A. (2004), ‘Tools for the body (schema)’, Trends in Cognitive Sciences, 8(2): 79-86. Great post. ‘The interesting question is: to whom did I do the most harm? The man who despises his arm or the lady with the prosthesis? Crucially, upon which person did I most intrude?’ – I would answer: the lady with the prosthesis. It’s difficult (at least for me) to empathise with the man who hates his arm since I can’t help but respond along the lines of, ‘But arms are useful!’. So instead I’m making the comparison with a pre-operative transgender person, since I find it easier to understand why somebody would despise sexual organs or other body parts that they could never find a use for, especially when these unwanted parts fundamentally affect their self-identity. I think that, in cases like these, answering the question ‘How much do we harm a person, P, when we harm their X?’ requires us to ignore the question of whether X is part of P’s body, ordinarily conceived. What matters, instead, is whether P thinks of X in roughly the same way that most people think of their body parts. Of course, this is a terribly simplistic approach, since not all body parts are equal (it’s better to lose a hair than a leg), and presumably not all prostheses (or other candidates for honorary body parts) are equal either. But to impose a mainstream conception of bodily boundaries on people who very obviously are not part of the mainstream seems exactly the wrong way to go about resolving the question you posed, and that I quoted above.